510 pages | 300 B/W Illus. Written from the perspective of the diagnostician, this bestselling book is the definitive text on the laboratory diagnosis of human viral diseases. It contains a wealth of illustrations, tables, and algorithms to enhance your understanding of this ever-evolving field. 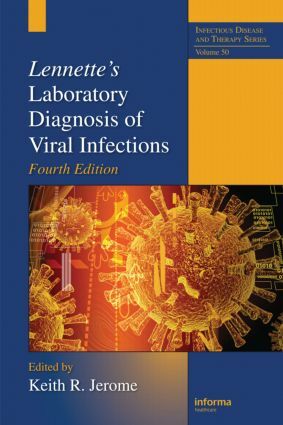 The book is a ready reference for virologists, microbiologists, epidemiologists, laboratorians, and infections disease specialists, and students. The clinical laboratory in the management of viral infections. Validation of Clinical Laboratory Tests. Assessment of Diagnostic Tests. Molecular Amplication Methods in diagnostic virology. Detection methods for nucleic acid amplification products. Design of molecular virologic tests. Virus isolation. Virus isolation. Diagnosis by antigen detection. Serological tests in clinical virology. Microscopy and cytology of viral infections. Electon microscopy of viral infections. Antiviral therapy. Upper respiratory tract infections. Lower respiratory tract infections. Common viral infections of childhood. Gastrointestinal tract infections. Infections of the skin and mucosa. Viral hepatitis. Hemmorrhagic fevers. Infections of the nervous system. Sexually transmitted infections. Immunodeficiency viruses. Infections of the immunosuppressed host. Ocular infections. Prion diseases.